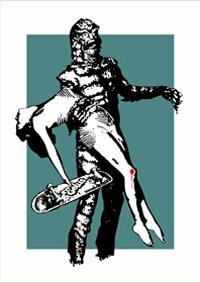 I have just been checking out EELUS's website and I see that he has some new screenprints for sale on his site. The print opposite titled "Creature Comforts" is a hand screenprint on heavy art paper and is a Limited run of 200 signed and numbered. Get 'em now as his screenprints sell out really quick. Also available on his site are some really tasty T-shirts featuring some great images and all at very reasonable prices.